This month, April 2019, we’d like to announce Narissa Liptak as the official Custom Fitness member of the Month! When Narissa weighed herself in around 190-195, she knew she needed to do more than just count macros. She has struggled with her weight and self image her entire life. Having a daughter who was struggling also, made the decision to join Custom Fitness. Narissa signed up for personal training with Sarah, an amazing motivator! Six weeks with her got her thru the holidays without gaining weight. After setting a goal to be a certain weight by vacation, she came to work out 4-5 days a week. 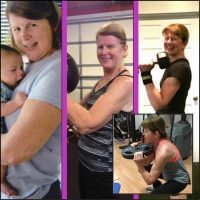 She and her daughter added group fitness in and started taking Pound with Beverly, rockin’ out, hitting things, and laughing with a great group of ladies. We say we are the lucky ones. We get the privilege of being a part of her life long journey and get to watch as she does nothing but climb higher and higher to reach her goals. CUSTOM FITNESS APPRECIATES YOU, NARISSA!! This month, March 2019, we’d like to announce Paula Bolduc as the official Custom Fitness member of the Month! Approximately 3 years ago, Paula started her membership and personal training with Sarah. She has rheumatoid arthritis, had a knee replacement, shoulder surgery and back surgery. Before joining the gym, she could barely walk without limping. She had struggles doing simple daily tasks and was frustrated that she couldn’t play or keep up with her grandkids. She wanted a change, so she joined Custom Fitness. When Paula started personal training with Sarah, she was doing the simplest of exercises with modifications. After about 4 months of consistency and persistence, she ventured out and added boxing classes to her workouts. 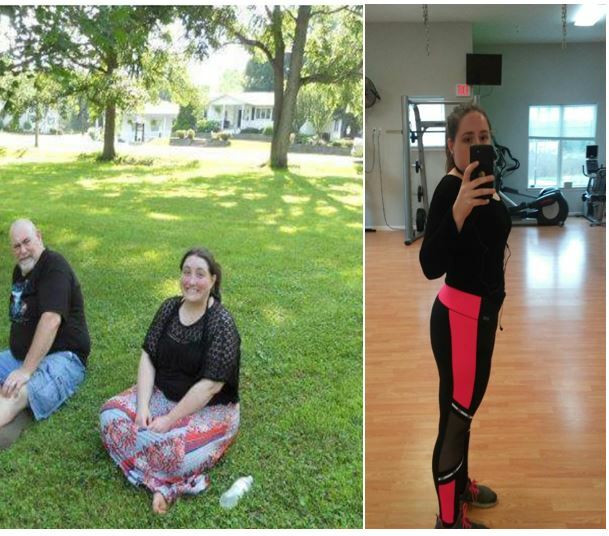 3 years later and many pounds lost, she continues to enjoy her weekly personal training sessions as well as Bootcamp, HIITz Total Body, and Spinning® classes where she loves to show off her strength and her “never quitting” attitude to the “young” ladies. She is 54 years old and feels healthier than ever! We are so proud of your determination and desire to overcome your obstacles and become the stronger, healthier person you are now. CUSTOM FITNESS APPRECIATES YOU, PAULA!! 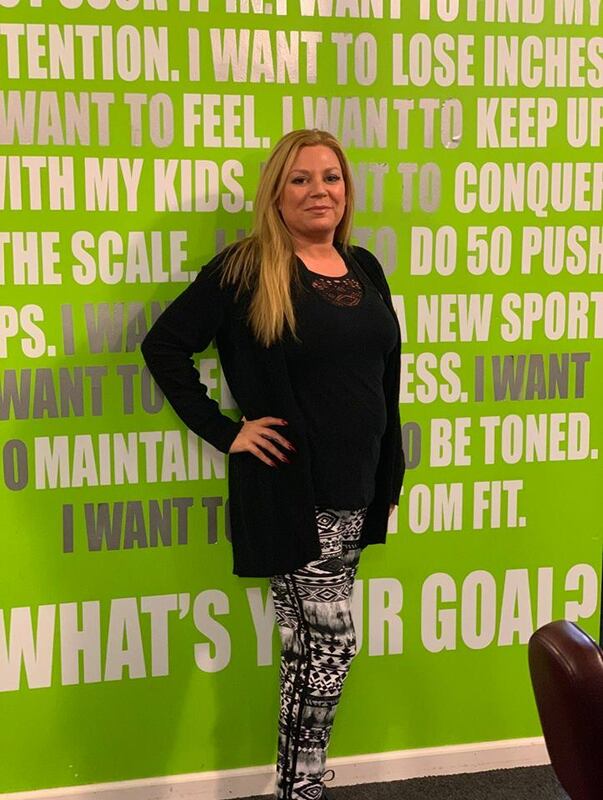 This month, February 2019, we’d like to announce Norma Myers as the official Custom Fitness member of the Month! Norma has been working with Jeanie for a little over year. The moment she walked through the doors she has brought a willingness to always be challenged in her workouts and a dedication to improvement. Her commitment to improving on the things that don’t come easy has helped her to lose over 10 pounds and put a significant amount of muscle on. Norma has a cheerful spirit, always welcoming to new members and sets a great example of hard work and leaving it all out there. We are so proud to know her and grateful to be the one she chose to take this journey with. 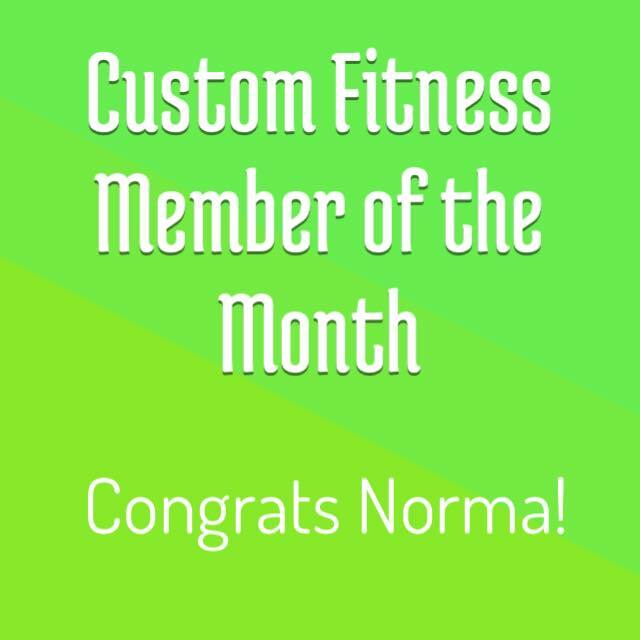 CUSTOM FITNESS APPRECIATES YOU, NORMA!! This month, January 2019, we’d like to announce Aleesan Fougere as the official Custom Fitness member of the Month! Aleesan started with Jeanie back in the day when the gym was in the garage. She decided to join Custom Fitness and resumed her training. She is extremely social with everyone in the gym, always makes an effort to make new members feel comfortable immediately, and is willing to help fellow members as needed. Aleesan has become stronger, healthier, and more confident all by pushing herself to give it her all at every workout and/or personal training session. Her consistent, energetic, and enthusiastic attitude rubs off on everyone in the gym. We are all inspired by her ability to have a true balance in life between family, work, and training. CUSTOM FITNESS APPRECIATES YOU, ALEESAN!! This month, December 2018, we’d like to announce Danielle O’Hara as the official Custom Fitness member of the Month! Danielle has been a member of Custom Fitness from the beginning. Group Fitness classes are her go-to workout. Her friendly, smiling, and humorous nature are what makes others want to take the classes with her. She has realized there are many health benefits to her workouts, not just because she has lost weight, but the natural improvement to her thyroid levels from the strength and conditioning classes she participates in. Her dedication to her health amidst her busy schedule/life as a business owner has inspired so many other hardworking individuals to continue their journeys even when they may not want to because life takes over. We are so proud of her determination and so happy to be a passenger on her health train!! CUSTOM FITNESS APPRECIATES YOU, DANIELLE!! This month, November 2018, we’d like to announce August Heinrich as the official Custom Fitness member of the Month! August has been athletically inclined since his childhood where he played just about every sport available. Though he drifted from fitness for a few years during college, he rekindled a love for it when he realized he needed some kind of outlet for the stresses of college life. What started as a way to relieve stress became beneficial for his physical appearance and ability, cognitive function, and overall well-being especially during the drab winter months. August, we are the lucky ones… to have been found by YOU! Your everlasting smile, politeness to everyone, and exceptional consideration of others is testament to the type of person we all strive to be. YOU are the reason we do what we do. CUSTOM FITNESS APPRECIATES YOU, AUGUST!! This month, October 2018, we are proud to announce Devon Packett as our official Custom Fitness Member of the Month. Devon started working out 5 years ago when, after a divorce, he decided he wasn’t happy with who he was and felt he needed to better himself in a way that only physical fitness could. His motivation quickly turned toward his son, Matthew, as he realized he wanted to always be able to pick up his ever-growing boy and be able to play easily in the many years to come. A member for almost 2 years now, Devon chose Custom Fitness because of the 24 hour access which works perfectly for him since he does shift work in the Navy. He also says, “Most of all though I like the staff. I normally keep to myself and listen to my music but they’re always really nice and chat when I’m coming in or taking off.” Devon is very respectful and conscientious of others here, always asking anyone who may be using the equipment if they are finished before he jumps on it. First and foremost, we want to thank you for your service and sacrifices to us and our country. We are very fortunate you chose us and became a part of our Custom Fit family! CUSTOM FITNESS APPRECIATES YOU, Devon! This month, September 2018, we are proud to announce Dawn Catone as our official Custom Fitness Member of the Month. A member since 2015, Dawn works out 3-4 times a week and says she can’t imagine not having it be a part of her life. She is constantly striving to make her life more fit and healthy. When you ask Dawn what her “why” is for wanting to be fit, she immediately credits it to her son Jordan. He is very athletic and motivates her to come even when she doesn’t feel like it. 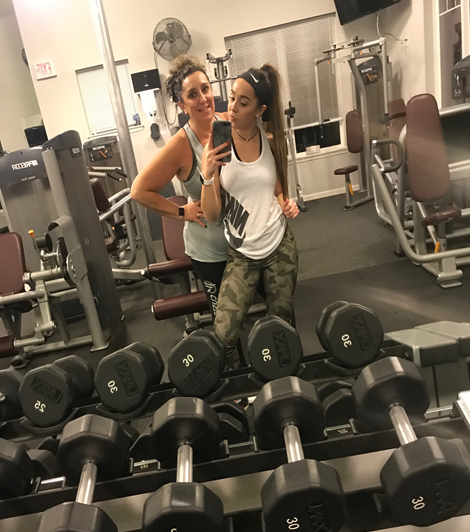 Working full time and being a mother to a teenager who has a very active lifestyle, she loves that she can come in at any hour of the day to get her workout in. She has referred many people to our gym and will continue to do so in the future. We are so blessed to have her as part the Custom Fitness family and WE can’t imagine HER not being a part of our lives! CUSTOM FITNESS APPRECIATES YOU, Dawn!! This family joined as residential members in April 2017 and have been daily visitors as a family ever since. Russell and Donna have made working out a commitment to themselves and to each other while Kaylee is away at school. When Kaylee is home for the summer or school breaks she is always working hard and pushing herself through “killer workouts” for her collegiate field hockey training. She has also taken advantage of personal training with Sarah and speed and agility workshops to reach her peak athletic performance. At Custom Fitness we truly enjoy watching the entire family workout, motivate each other, laugh and sweat together, and making health and fitness a family priority. When told they were selected to be members of the month they were excited to share their feelings about Custom Fitness! We are so happy to have your family be a part of our CFIT Family!!! CUSTOM FITNESS APPRECIATES YOU, RUSSELL, DONNA, and KAYLEE!! 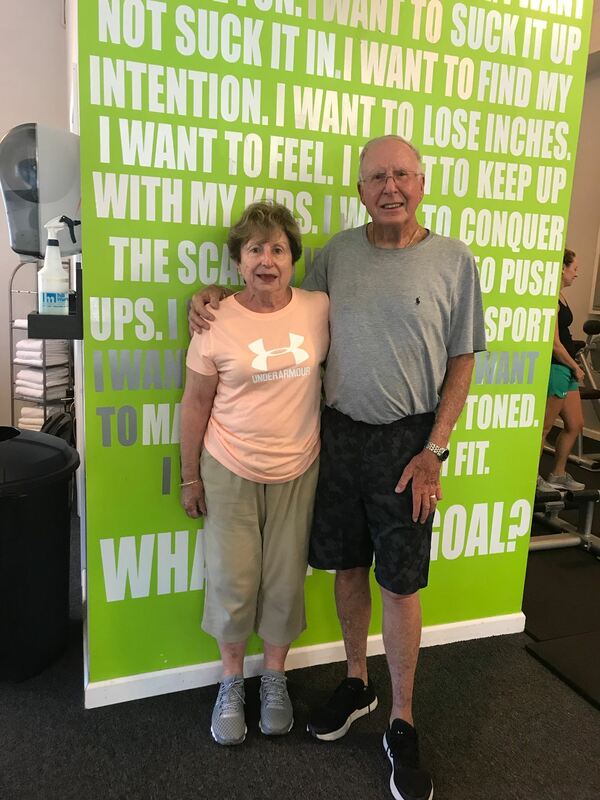 This month, July 2018, we’d like to announce Ann & Jerry Eichin as the official Custom Fitness members of the Month! Ann and Jerry started working with Jeanie a few months back and they are a true success story. Ann came to Custom Fitness struggling with her weight and has dealt with pain in her knee resulting from surgery. Jerry, who also was struggling with his weight, has had to deal with some health issues. They were determined to get healthy and fit and that is truly what they did!! Since the day they walked in, each have lost over 10 pounds, built muscle, become stronger, and both are able to do things that they never believed possible. They continue to put 100% in their workouts and 100% in following the meal plan, earning 100% results. Every year they go to their rental in Lake George where they’ve struggled getting around with the hills in the area, so they simply avoided them. Not this year! This is the first year they were able to overcome and conquer the hills putting them in their morning workout. They are an inspiration to anyone who thinks it is too late to commit to the process of healthy living. CUSTOM FITNESS APPRECIATES YOU, ANN & JERRY!! This month, June 2018, we are proud to announce Laura Irish as our official Custom Fitness Member of the Month. Laura began her fitness journey in November 2016. Since that time she has lost 100lbs! She began working out regularly and changing how she ate. She used to eat farmer sized meals 3 times a day and snacks throughout as well. When she decided to change her eating habits, she realized if she ate smaller portions and “grazed“, the scale went down. She also gave up all soda and all food that had “fillers” like chips and pastries. She now eats more protein and much healthier snacks to help combat her hunger and her body also utilizes it for fuel instead of storing it. We are so blessed to have her as part the Custom Fitness family and she is such an inspiration to all who know her. She is testament to the fact that the struggle is real, but if you set your mind to fighting for your health, YOU WILL WIN!! CUSTOM FITNESS APPRECIATES YOU, LAURA!! This month, May 2018, we are proud to announce our very own Jennifer Martin as our official Custom Fitness Member of the Month. 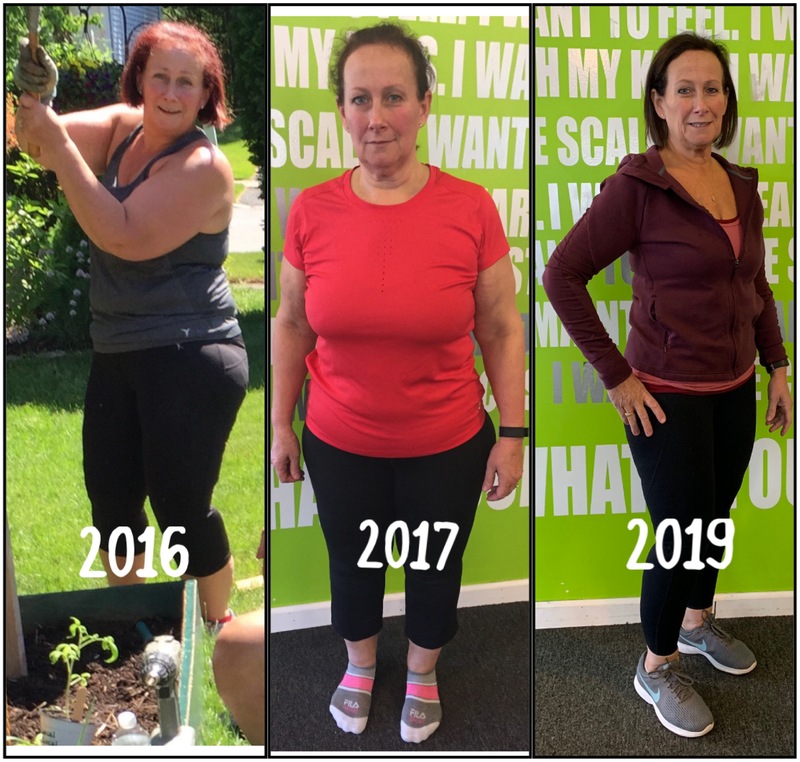 Jennifer started training with Jeanie 7 years ago when she felt she was getting a bit overweight, had very little muscle, and wanted to have a strong, fit body. Jeanie explained to her that losing weight was not going to be enough for her and she would need to lift weights in order to achieve the look she wanted. Jennifer became very focused and determined. She and her husband, Leo, are business owners of 3 different small businesses and parents to their son Max. Although her family and businesses take up a LOT of the hours in her day, she made the time for herself to stick with her workout regimen. She worked so hard at strength training, cardio, and a healthier diet that she started to see the results instantly. She was losing weight, but gaining muscle and definition rapidly. She was so happy to be succeeding at achieving her goals with Jeanie’s help that she herself wanted to help others achieve it too. 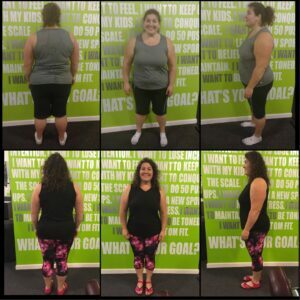 Within a year after she started her journey, she became a Certified Personal Trainer so that she could pass along not only the feeling of being mentally and physically healthy and fit, but also so that others could love their bodies and see their accomplishments when they look in the mirror like she does. 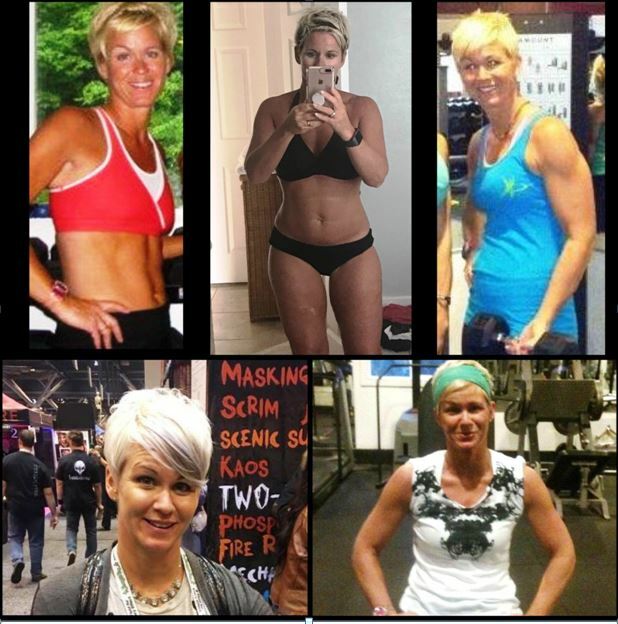 She began taking on clients and has been on our team of personal trainers ever since. We are so blessed to have her as part the Custom Fitness family. She will probably kill us for posting the photo of her that you see here, but we don’t care because we are so proud of her transformation that we want the WORLD to see it…even if she doesn’t. CUSTOM FITNESS APPRECIATES YOU, JENNIFER!! This month, April 2018, we are proud to announce Tammy Sutphin as our official Custom Fitness Member of the Month. Tammy truly exemplifies the individual that we created Custom Fitness to serve. She is hard working, dedicated, and not afraid to sweat. Tammy always brings to the gym a fantastic attitude and willingness to do whatever new things her trainer throws at her. Leg day has become her favorite day! A realtor with a busy schedule, she always makes the time to invest in herself and her health. The spirit she brings with her to every workout is contagious and brightens up the entire room. Ask anyone in our community and they will tell you how awesome she is! We are blessed to have her as a member of the Custom Fitness family and this community really wouldn’t be the same without her. CUSTOM FITNESS APPRECIATES YOU, TAMMY!! This month, March 2018, we are proud to announce Carwyn Kruler as our official Custom Fitness Member of the Month. Fitness has always been fun for her, as she started competing in gymnastics right out of kindergarten. When she left organized sports in college, she still continued her fitness quest doing lots of yoga and swimming. 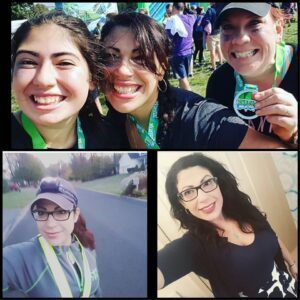 When she was about 24 years old, she learned that she could run and that it really helped with stress and was very proud to be able to run a half marathon that first year. Running, yoga, and rock climbing were her go-to workouts for several years. Upon moving to the area 3 years ago, she decided to try fitness classes to supplement the time she couldn’t get outdoors with work/life. She was pretty skeptical as she had never felt comfortable in the classes she had tried so many years before. The first class she walked into at Custom Fitness was Body Rip and fell in love with the challenge of the full body workout, the SUPPORTIVE instructors, and the SUPER FRIENDLY classmates who introduced themselves to her without hesitation. A soon to be new mother she continues to participate in classes whenever she can and often times will come in for a workout on her own. 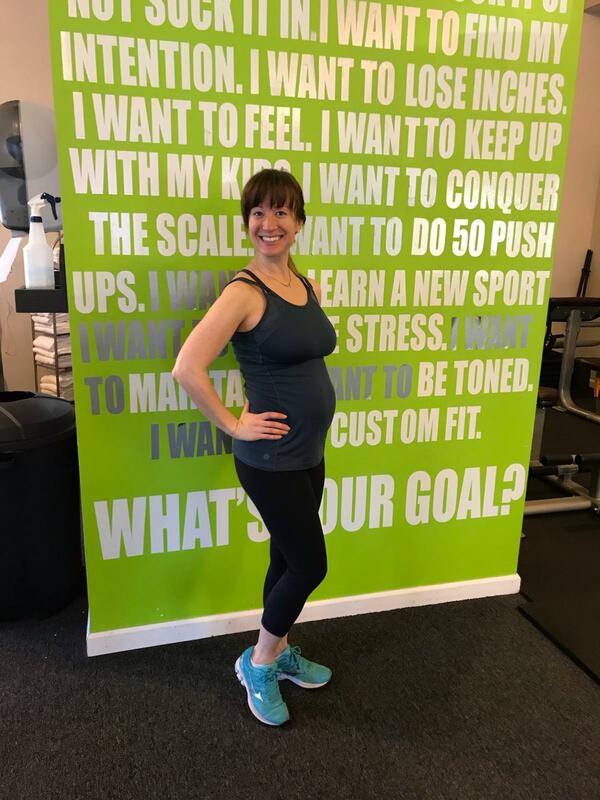 Early on in her pregnancy, she started attending personal training with Jeanie so that her workouts would be tailored to her changing body. Her commitment to the health and well-being of her mind and body during this pregnancy is not only inspiring, but motivating to the other members she already knows and also the new ones she meets. We are not only proud of your tenacity and dedication, but also powerfully enlivened by your spirit! CUSTOM FITNESS APPRECIATES YOU, CARWYN!! This month, February 2018, we are proud to announce Amy Murauskas as our official Custom Fitness Member of the Month. 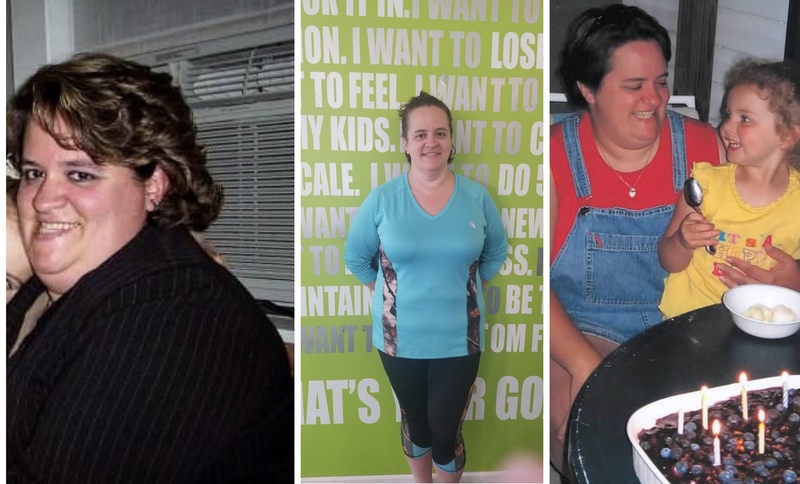 Amy’s fitness journey began about 16 months ago when she finally decided that it was time & OK for her to start thinking about herself and making fitness and her health a priority. 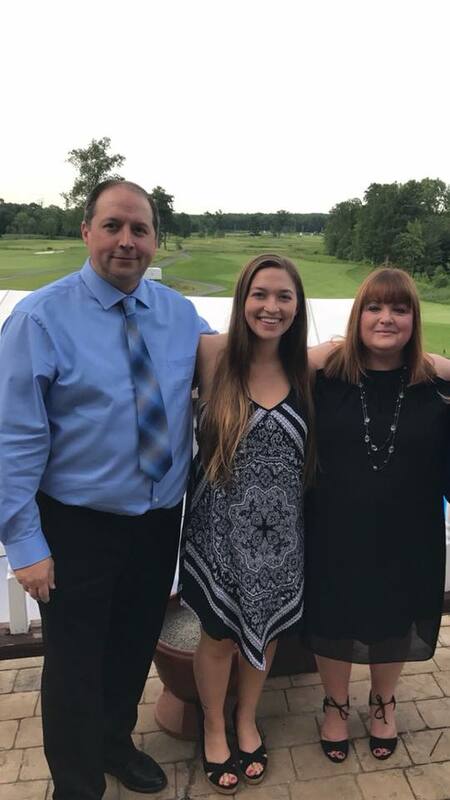 She works a full-time job, has 3 children involved in many sports, clubs and extracurricular activities, and helps her husband run his business. Amy thought it wasn’t possible to find the time to go to the gym. She found that our around-the-clock group fitness classes and 24-hour gym access works great with her busy schedule and has now made exercise a regular part of her daily routine. We are proud of you grit, determination, and that you jump over your daily hurdles now with ease and a sprint at the end!!! 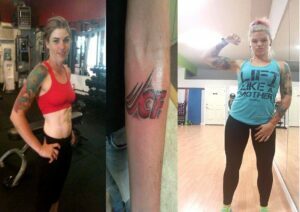 Amy is Custom Fit Strong! This month, January 2018, we are proud to announce Tara Burczeuski as our official Custom Fitness Member of the Month. Tara has been an ultimate unlimited member since 2016. She is a dedicated early riser that never misses a workout. Before Custom Fitness she claims she couldn’t run a full mile and this year she completed the Adirondack Ragnar Relays and has registered for two more, including her first half marathon. Tara now uses her fitness journey and gym experiences to help support others through her positive go-getter attitude in class, on-going commitment to herself, and additionally runs a support group on Instagram for women who are afraid to get into fitness. Tara works full time as a wife and a mother to a 13-year-old and twin 10-year-old girls. She is their girl scout troop leader and also their mentor, as they have all begun to become runners and lift weights because of her positive influence and role modeling of the need for a daily fitness routine and healthy lifestyle. Thank you for being a member of our Custom Fitness family. We are proud to kick off the year with your fitness story and applaud you on all of your hardwork! To be an inspiration is one thing, but to be an inspiration to young girls and/or to anyone who struggles with just starting their fitness journey is an outstanding accomplishment! CUSTOM FITNESS APPRECIATES YOU, TARA! This month, December 2017, we are proud to announce Chris DelGiacco as our official Custom Fitness Member of the Month. Chris started training at Custom Fitness from day one. His wife Kathy was one of our first Members of the Month! Having been a pitcher for Minor League Baseball, his desire to be physically healthy and fit began years ago. After having to have knee surgery last February, Chris was told he needed to stay away from the gym for 6 weeks. He was not happy about that, and after a week or so was back at it training every other part of his body he could without that knee. That dedication and determination is inspiring to us all. Thank you for being a member of our Custom Fitness family. We are proud to be a part of your desire to be physically healthy and fit and look forward to that smile that’s always on your face. CUSTOM FITNESS APPRECIATES YOU, CHRIS! This month, November 2017, we are proud to announce Theresa Felton as our official Custom Fitness Member of the Month. Theresa has been a member and a devoted group fitness participant for over a year! She is busy mom, wife, and career woman who spends a lot of her time running, swimming, and bicycling…‍♀️‍♀️‍♀️yes she does triathlons. 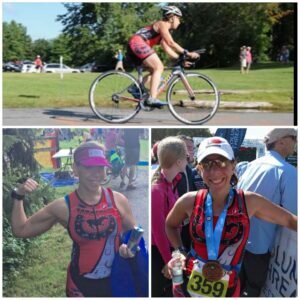 She is a member of the Saratoga Triathlon Club and is a huge leader for many 5ks, half and full marathons, and the Ragnar Relays where she fills her teams up with Custom Fitness members. She originally joined the gym to “tighten and tone” but through her gym usage and class participation, she has lost up to 15 lbs., took 15 minutes off of her half marathon time, and has started placing in her age group. You will see her in the early hours dressed in reflective gear as she runs to and from the gym to attend our morning classes. Theresa is a true health and wellness advocate in her career and personal life. We applause all of her accomplishments, hardwork, and dedication! This month, October 2017, we are proud to announce Adam Britten as our official Custom Fitness Member of the Month. Adam joined Custom Fitness almost 2 years ago! He is a busy man being an awesome dad to two kids, a fit and caring husband, and an owner of his own business, Home Base Recruiting Group, LLC. 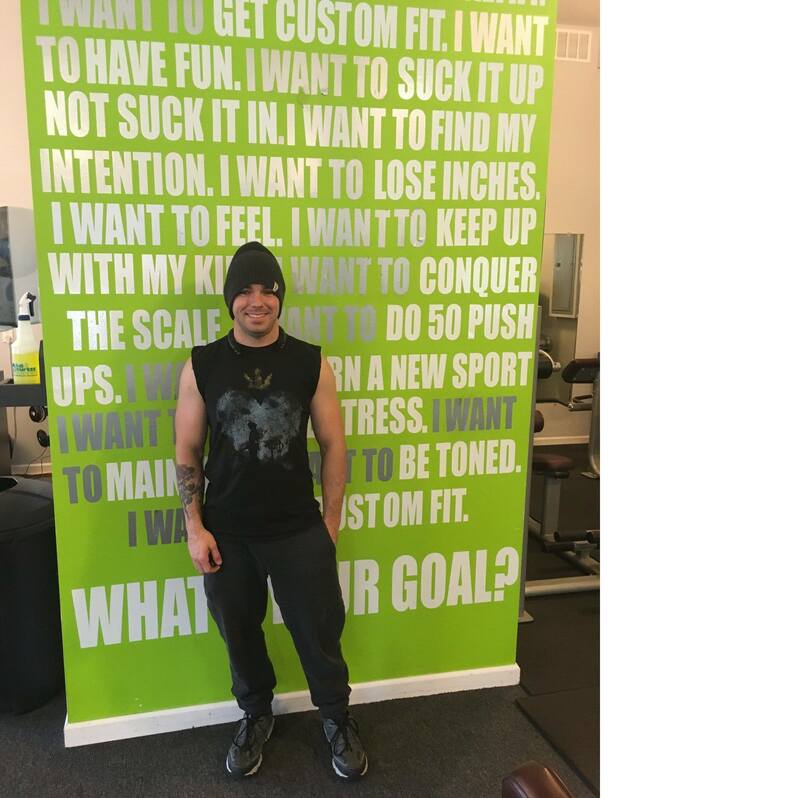 With all of those jobs and roles it’s hard to find time to get a workout in, so Adam chose Custom Fitness for its 24/7 gym access which allows him to get his workouts in on his terms. 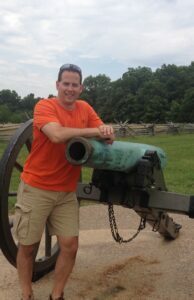 Adam happily comes in consistently and makes his fitness and health a priority. 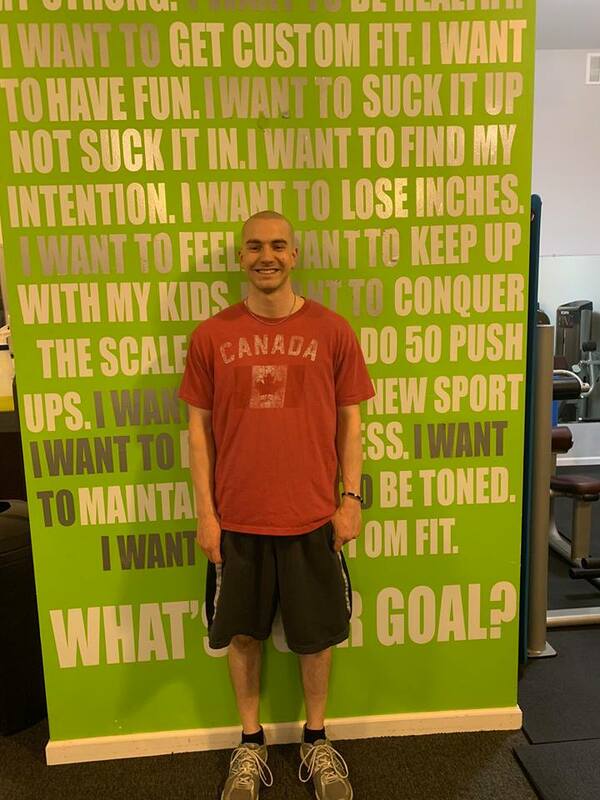 We are so happy to have Adam as a part of our Custom Fitness Family and we appreciate all the kind words he has spoken to many others in his community about “his” gym. CUSTOM FITNESS APPRECIATES YOU, ADAM! This month, September 2017, we are proud to announce Laura Cuthbertson as our official Custom Fitness Member of the Month. Laura joined our family in 2016 after her husband became a member. She is a face you will see in the gym daily at all different times of the day and you may even hear her singing along with her IPOD! As a teacher, wife, and mother, her schedule is quite hectic, but she always makes sure to get her weight training and cardio in no matter what. Being healthy and fit is THAT important to her. She is extremely friendly to all and she always has a smile on her face or encouraging word for anyone that needs it. We are so grateful and proud she allows us to be a part of her quest to be healthy and fit and to have her as a member of our Custom Fitness family. CUSTOM FITNESS APPRECIATES YOU, LAURA! Heather to keep the weight off, she was determined to get back to her goal weight once she stepped in the door at Custom Fitness. After a steady start, the last few months we have seen tremendous progress each week because of her dedication. 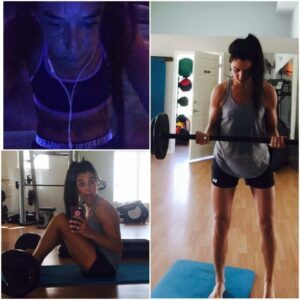 Heather has thoroughly embraced resistance training and now follows a structured and progressive programmed with grit and determination. Heather is extremely hardworking and a pleasure to train. She continues to exceed my expectations week after week in PT sessions, always showing enormous versatility towards new training methods and exercises. I’m very proud of her achievements, not only have I seen positive changes to her physique but also to her mindset and confidence, seeing her really come into her own. The change in body shape has been quite something to behold. With a willingness to listen, learn, apply what she has learned, she has lost over 10lbs!!! Heather gets in, gets on and gets it done, she is never afraid to ask for help or push through those ‘make a difference’ reps. I believe we still have much to see from Heather. Well done to you, keep doing what you’re doing! CUSTOM FITNESS APPRECIATES YOU, HEATHER!! This month, July 2017, we are proud to announce Kimmie Kaetzel as our official Custom Fitness Member of the Month. Kimmie started training with Jeanie 7 years ago at Jeanie’s Custom Fitness studio. Her goal was to lose weight so she could continue to ride horses. Not only did she drop the weight, but she put on a substantial amount of muscle. With this new body came an offer for a jockey position at the race track. Soon after that she started her family and moved away. Kimmie comes back every year during track season and continues to be the loyal client she has been since the beginning. She continues to work hard to maintain her weight and muscle mass even with her crazy track schedule. Thank you for being a member of our Custom Fitness family. We love the energy you bring while here and surely miss it when you are gone. You are a true mascot for Custom Fitness. This month, June 2017, we are proud to announce Alyssa Keegan as our official Custom Fitness Member of the Month. A CFit member since September 2016, Alyssa has taken her desire to lose weight to the highest level. She is regularly seen in multiple group fitness classes daily and gives 150% in each class whether it’s the first one of the day or her second. Having this drive is what allowed her to lose 17 lbs to win third place in our CF 2017 Weight Loss Challenge. Alyssa knows there are obstacles she will encounter on this quest. She will meet them all head on and won’t let them stop her. She helps to motivate others in class helping them to gain her “can’t stop-won’t stop” attitude. Alyssa’s dedication inspires us all. Thank you for including us in your quest and for being member of our Custom Fitness family. CUSTOM FITNESS APPRECIATES YOU, ALYSSA! This month, May 2017, we are proud to announce Sherry Pronto as our official Custom Fitness Member of the Month. 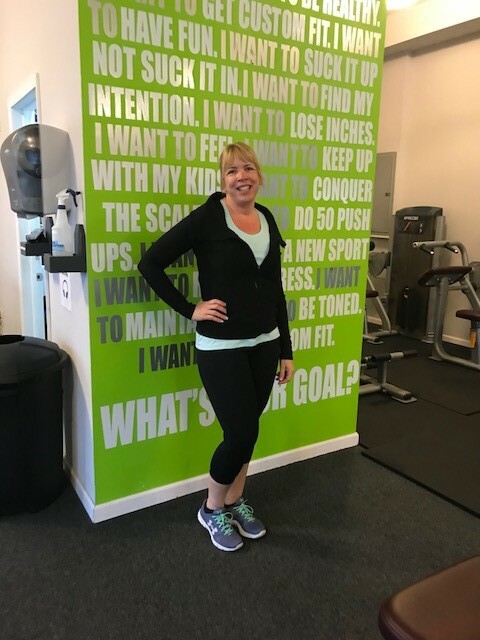 Not only a member of the gym and our go-to for medical advice, Sherry has taken great strides in improving her health and well-being by originally utilizing our personal training program, progressing to group fitness classes and ultimately becoming a member who is always a top contender in our weight loss challenges. 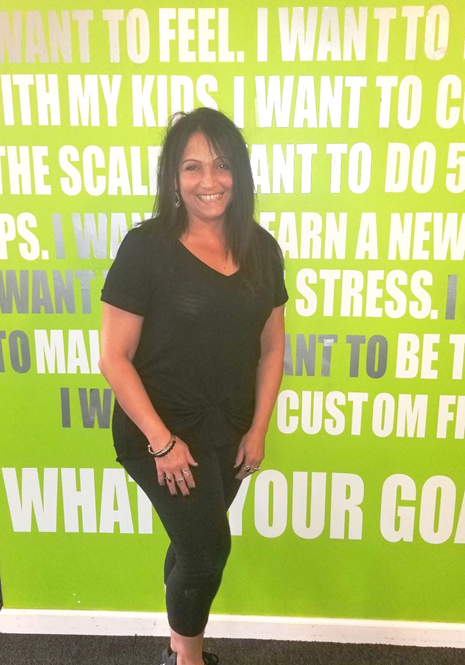 A regular “double-dipper”, Sherry has such drive and fire that we cannot help but admire her enthusiasm for living her physically fit life to the fullest. Our “grandma with muscles” is not only an inspiring person to all, but a true testament that no matter what age or fitness level you start at you can absolutely achieve any goals you set. You just have to stick with it! Thank you for including us in your pledge to live a healthful life and for being an inspiring member of our Custom Fitness family. CUSTOM FITNESS APPRECIATES YOU, SHERRY!